Perhaps it was kismet that Ernest Barnes (1938-2009) was born in 1938 on July 15th, the same date that Rembrandt was born in 1606. Ernest was a shy child who drew in the mud. He marveled at the paintings at the house where his mother was a housekeeper when he accompanied her to work. His mother knew of his love of art, and she also knew that Ernest wouldn’t be welcomed into art museums in the segregated South. As a plump and timid boy, he was sometimes taunted and bullied. Ernest began to carry a sketchbook with him, to escape that reality. He chronicled the everyday life that he saw – the junk man and families walking home from church. When he was in high school, a weight coach discovered him off by himself and drawing. The coach convinced 6’3” Ernest to begin to fitness train in order to feel better about himself. He then joined the football team and excelled at the sport. By his senior year, he was the captain of the team, and he received twenty-six offers of scholarships from colleges to play football. Choosing North Carolina College at Durham, Ernest played football and studied art. One of his art teachers, Mr. Wilson, encouraged him to continue to look all around him and be inspired by what he saw. Ernest was drafted to play professional football, and that’s when he became known as Ernie. Even when he was on the bench or in the midst of a game, he was inspired by the color and action around him. The sideline images inspired him to paint The Bench, which became a major piece in Barnes’ body of work. He never sold The Bench, and it is now in the Pro Football Hall of Fame in Canton, Ohio. When his football career ended, Ernie was finally able to devote his life to his art. He continued to explore the beauty in scenes of everyday life. His work is characterized by movement and color. Ernie was asked to be the official artist of the 1984 Olympic Games because art critics called him “America’s best painter of sports”. However, Ernie tackled many subjects other than sports. His painting, Sugar Shack, appeared each week at the end of the popular 1970s television show, Good Times. When the star of the show, JJ, became an artist, it was Ernie’s paintings that were used. Marvin Gaye also featured Sugar Shack as the cover of his album, I Want You. When he was in college, Ernie was at an art museum and questioned why artists of color weren’t represented there. A docent answered him, “Your people don’t express themselves in that way.” Ernie knew this wasn’t true, and today his work is owned and displayed by museums all over the United States. 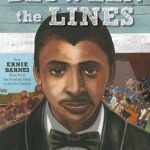 Author Sandra Neil Wallace and illustrator Bryan Collier teamed up to introduce Ernie Barnes to young people. 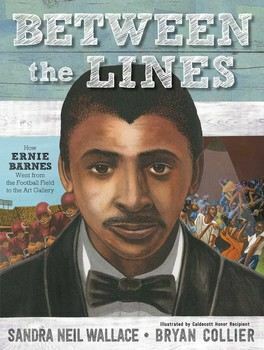 Adults should check out Between the Lines to share it with children and enjoy it themselves.